This simple yet well made early style antique Chinese brazier stand with arrow style legs from the north is made of Yu wood, northern Chinese elm. Construction is very simple but well suited its function with generous thick cuts of wood joining together without waste of parts. One can see from the additional detailed photo the two indented areas where it once held probably an iron pan with burning coals inside to keep the feet and the room warm. 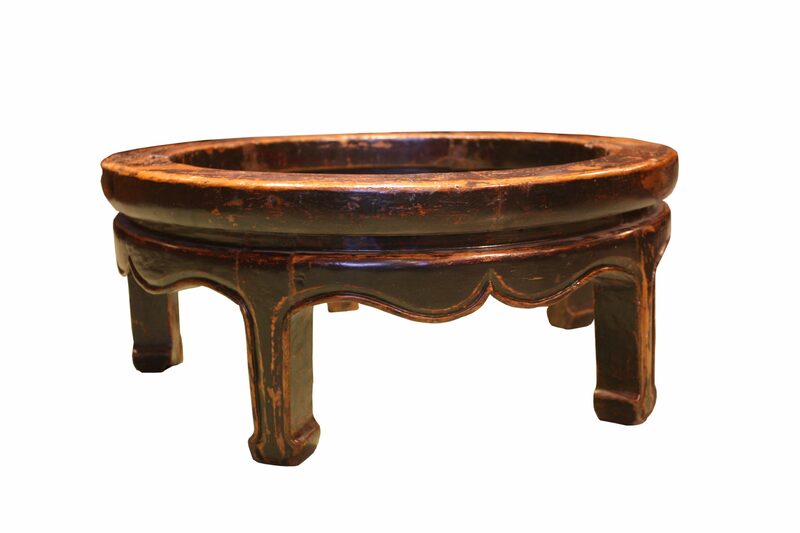 This brazier stand still retains the original dark lacquer finish which has now worn to be a beautiful patina. Arrow style legs or feet is a common feature for northern style Chinese furniture from Yangtze River and up north with many variations of the style. It can be really fun to examine all the varieties. Please note the corresponding shape of the leg at the top where it joins the waist of the stand with the apron in between the legs. Northern Chinese elm, unlike southern Chinese elm (Ju wood) which grows very slowly and takes often over 100 years to form an usable size tree, northern Chinese elm can grow to a big tree within five, six years. Therefore, it's a popular wood for the local furniture makers. Dried or aged northern elm is today perhaps the most common wood used for reproducing new furniture pieces for its showy beautiful large grain.